Are YOU interested in volunteering your time and life energy to the most worthy of causes, spreading the Word? CONTACT US BY EMAIL to find out about current projects or to share ideas you might have. In unity, we prevail. Join the Ground Crew Today! 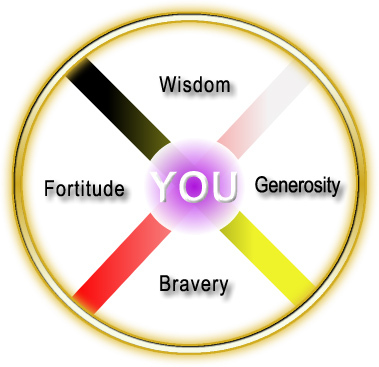 The third virtue that escapes your memory is that in which you excel, chela--wowacintanka---fortitude! You have just forgotten. These things must be told and put unto the press that my people can be in the remembering. I am Grandfather Aton to speak to you. Your mind shall be kept veiled in your consciousness for man is not yet ready to hear it all and man's tongue is attached so solidly to his consciousness that it spills over as prompted by his ego. Ye shall simply clear of all dark clowns from your space and write that which we bring to you just as you have been doing these months past. If my words bring embarrassment or a swish of guilt upon ones who are in the receiving then it is time that they pay attention. No thing more and no thing less. You walk the road of light and the messages are not always for you to decipher---much the less for you to project in your interpretation. You shall be given to understand the difference. You shall seek wisdom which is the first virtue, first in all things and the rest shall be added in properness. You shall persist in woohitika, which is bravery, for you know the best and the worst and from the worst shall rise the best. You shall also continue to put my Truth to the pages lest you fail your last test, that of wacantognaka---generosity. As Truth is given forth and ones who receive clutch it and hide it in the darkness---or sell it for earthly worth greed or putrid ego satisfaction, the virtue of generosity is lost for unless you give it forth you cannot receive of the abundance back into the beingness which is truly you within. Wisdom comes from the errors committed and not repeated. So be it. With wisdom comes the knowledge that all things are binded together by the strands of each bound together as the cohesive whole. Wisdom is the recognition and reverence (not worship) of the seen and the unseen, the known and the unknown working together and interacting in such a way as to bring balance unto that which is The Creation of that One from which you come. But simply to be in the knowing does not bring wholeness for unless there is the act of generosity and sharing---action---the fourth virtue is failed.